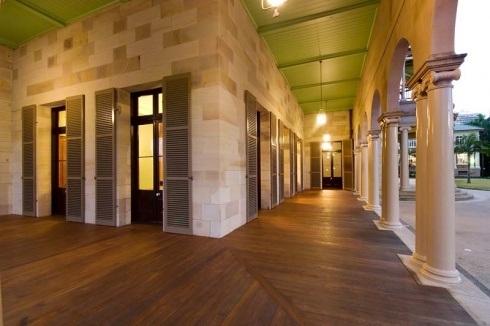 In September 2007, Kane were awarded the restoration of one of Queensland’s most significant heritage buildings, Old Government House. 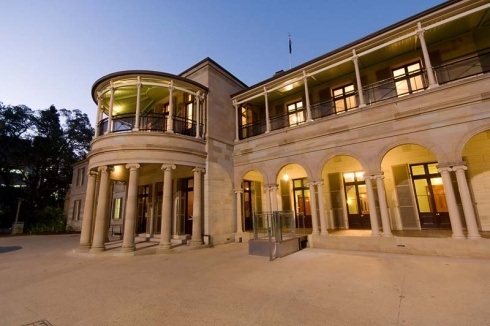 Constructed in 1862, it was the first public building designed and constructed for the newly created colony of Queensland and served as the primary residence for the first 11 Governors of Queensland. When Kane started on site, there was some obvious, but isolated termite damage. However, during the removal of the existing ceiling linings, the full extent of existing damage to the structure became clear. Numerous roof trusses and ceiling joists, through to wall frames, floor bearers and joists were degraded to such a level that they required immediate emergency support. 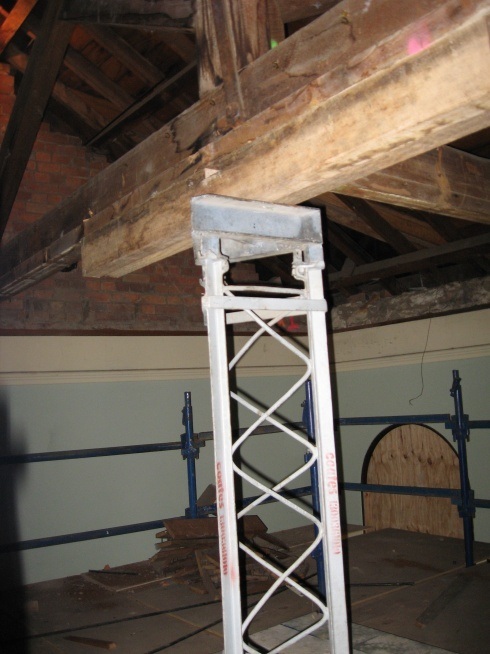 Multiple tri-shore props were installed in the middle of the building, one through the main stair and two through the atrium, from the main roof trusses, to founding ground, as an immediate temporary measure to ensure the roof would not collapse. To ensure the building would be protected from termite damage in the future, a subfloor reticulation system was installed that acts like a typical irrigation drip system that enabled termite poison to be pumped into the subfloor of the building from designated injection points around the perimeter of the building without needing to disturb restored flooring. 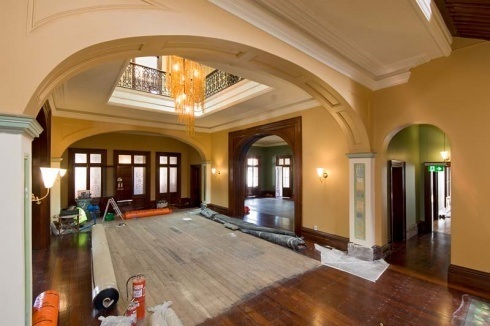 Following the structural repairs and termite protection works, a large number of highly skilled traditional tradesmen were required to restore the existing fabric back to its original level of finish including stonemasons, French polishers, and traditional renderers - including heritage cornice and carpentry restorers. A custom built open and glazed hydraulic platform lift was designed and constructed inside the building. Following the principles of the Burra Charter, this lift was architecturally (and strikingly) modern to identify it as an addition to the surrounding heritage fabric. The grounds around the building were also considered of high heritage value and a specialist arborist was engaged throughout the project to ensure protection of the existing landscape which included periodic reports consisting of a number of tests and inspections on the tree’s status and health. Project completion was achieved in time for the Brisbane 150th anniversary celebrations and the effort by the Kane team has been personally recognised by the Vice Chancellor, Peter Coldrake, noting the proactive and sensitive approach to the restoration process. 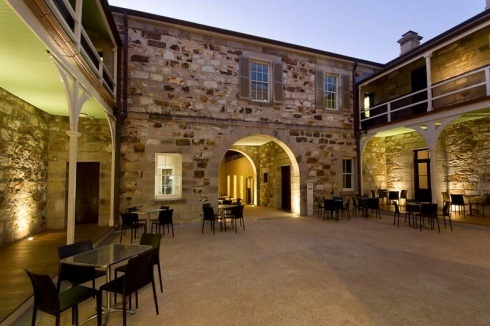 At the 2009 National Trust of Queensland Heritage Awards, it collected two awards: the Gold Award in the Conservation Works category, together with the John Herbert Memorial Award for Most Outstanding Nomination for Excellence in Heritage Conservation Works. Kane are proud to have restored this already exquisite building, which will continue to serve for many years to come.